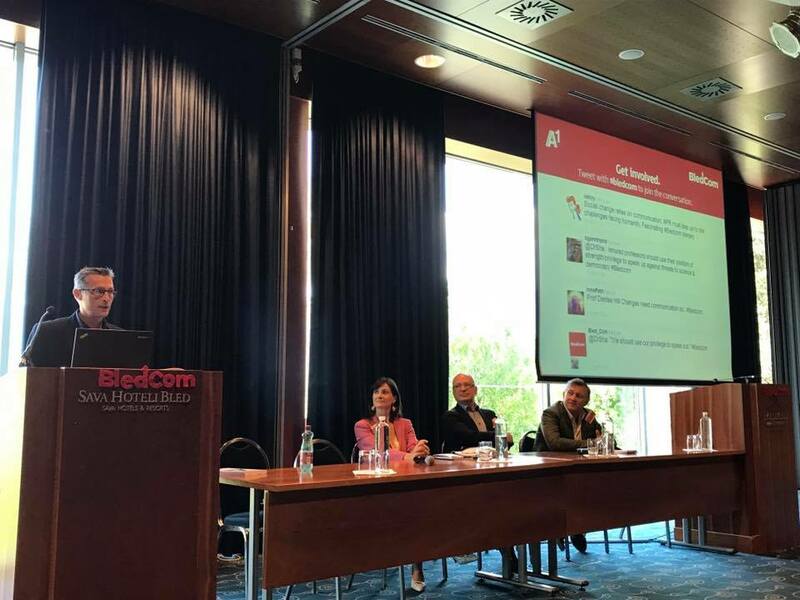 Dr. Piet Verhoeven represented our team at the 24th International Public Relations Research Symposium BledCom 2017 in Bled, Slovenia. BledCom is an annual gathering of the world’s elite of academics and practitioners in public relations and related disciplines to discuss contemporary communication and management problems. The main topic of 2017 was “CSR in Hypermodern Times”, expressed in the following sub-themes: corporate social responsibility (CSR), CSR communication, inbound (behavioural) CSR and outbound (symbolic) CSR, CSR reporting, spirituality, religion and CSR, CSR in the digital world, CSR and mediatisation, CSR and international migrations. During the symposium, the book Communication Excellence – How to develop, manage and lead exceptional communication, written by renowned European communication researchers Ralph Tench, Dejan Verčič, Ansgar Zerfass, Angeles Moreno and Piet Verhoeven, was launched. It puts forward a new framework of communication excellence based upon 10 years of empirical data and the views of over 21,000 practitioners in communication across 46 countries in Europe. The book discusses the excellence framework with clear reference back to the experience of practice and practitioners in high performing organisations and departments. Case studies are used to exemplify each of the commandments from well-known international brands such as Santander, Electrolux, Porsche, KMPG, DHL and more. It is aimed at practitioners as well as researchers in the discipline who are keen to explore and understand more about contemporary strategic communication and what factors contribute to high performance in this competitive environment. The book is based on data from the European Communication Monitor (ECM), the largest global study of public relations and strategic communication practice. It has been conducted annually since 2007 and is complemented by bi-annual surveys in other regions (Latin America, Asia-Pacific) since 2014. The communication monitor series covers more than 80 countries altogether. It is the only continuous global research in the field which adheres to full standards of empirical research and provides transparency about its sampling procedures and respondents. A joint study by academia and practice, the ECM is organised by the European Public Relations Education and Research Association (EUPRERA) and the European Association of Communication Directors (EACD), supported by different partners over the years. Bibliographic information: Tench, R., Verčič, D., Zerfass, A., Moreno, A. & Verhoeven, P.: Communication Excellence – How to Develop, Manage and Lead Exceptional Communications. London: Palgrave Macmillan. 247 pp., April 2017. ISBN 978-3-319-48860-8 (eBook), ISBN 978-3-319-48859-2 (Paperback).